March 11, 2014, SACRAMENTO – Senators Ted Lieu, (D-Redondo Beach), Carol Liu (D- La Cañada/Flintridge) and Leland Yee (San Francisco/San Mateo) today requested Assembly Speaker John Pérez hold Senate Constitutional Amendment 5 (SCA-5) to allow more time to discuss its potential impacts with stakeholders and the Asian Pacific Islander community. 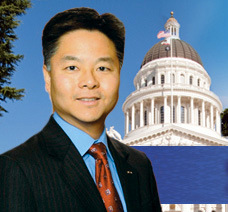 State Senator Ted Lieu (from sd28.senate.ca.gov). “We are writing to respectfully request that you hold SCA 5. Prior to the vote on SCA 5 in the Senate, we heard no opposition to the bill. However, in the past few weeks, we have heard from thousands of people throughout California voicing their concerns about potential impacts. As lifelong advocates for the Asian American and other communities, we would never support a policy that we believed would negatively impact our children. Given that many in the API and other communities throughout the state feel that this legislation would prevent their children from attending the college of their choice, we have asked Senator Ed Hernandez to hold SCA 5 until he has an opportunity to meet with affected communities and attempt to build a consensus. The following is some pictures of protesters at a townhall meeting on SCA-5 in Cupertino on March 2. Great news! Cupertino City Council will hold a special meeting to discuss whether or not to send an opposition letter to California State Legislature regarding California State Constitution Amendment # 5 (SCA-5). The special meeting will be held on next Monday, March 17, 2014 at 3 PM at Cupertino Community Hall on 20310 Torre Ave., Cupertino, CA 95014. You can speak under public comment period. You can have your power point presentation, slide show, video show or your own show. Any one can speak. You just need to fill out a speaker card at the meeting. You don’t have to have American Citizenship or to be a resident of Cupertino to speak. Again, ANY ONE CAN SPEAK. You can also speak the language that you are comfortable. Generally, you will have three minute per speaker. Our mayor may cut it to 2 minutes or shorter. You can also have a group speaker representing your group (10 people can be considered as a group). That way you will have more time, about 10 minutes. Again, the mayor may cut it to 7 minutes or shorter. The meeting will be televised. Please be prepared, dress up, be calm, be polite and be respectful. If you don’t dress up, you will not look good on TV. And, if you are too emotional, you will not look good on TV, either. Remember, you only need three city council’s votes (majority votes) to pass. If it is passed by majority votes, we will then send an opposition letter to California State Legislature in regarding to SCA-5. You can plan to have a rally for an hour outside of the Community Hall at 2 PM before the meeting start and invite all medias to attend. I know Senator Ted Lieu, Leland Yee and Carol Liu for many, many years. They are doing their best for our community. Remember Chinese old saying: If you can forgive people, please forgive them. Your main focus is to Stop SCA-5 in the State Assembly now. As you can see, Senator Lieu, Yee and Liu are working hard trying to Stop SCA-5. Please give them a little bit of encouragement. Remember American saying: In politics, there is no forever friend, nor forever enemy.